In Berlin 1994, a German six piece who would go on to sell over 15 million records worldwide was formed under the name Rammstein. Following their 2009-11 ‘Liebe Ist Für Alle Da’ world tour, Rammstein turned the opportunity of a break down to return with a best of album and tour entitled ‘Made In Germany’. 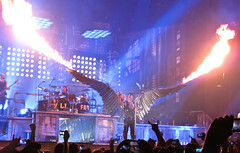 This brought Rammstein’s biggest production and anticipation to date with praising reviews from both fans and critics. form of recording two nights in Bercy, Paris by accomplished director Jonas Åkerlund. I’m using this example of a production as it shows off the creative skills used in the media industry. A production like this allows for a higher quality recording in terms of variety. With the 12 hired cameras for these two nights the camera operator can be placed in different locations and then capture multiple angles when instructed to by the director. In addition to this, miniture ‘GoPro’ cameras were used to film the band on the small stage as well as a camera within the dingy boat used to crowd surf keyboardist Flake. Further cameras were recording members of the audience to capture the atmosphere of the two nights with the band sharing a special relationship with the French audience. The production company for these shows were ‘Done and Dusted’ who have worked previously with Rammstein on 2006’s ‘Volkerball’ DVD and a 2010 show recording in New York/Montreal which is currently unreleased. Speculation says the band will release both these shows or highlight them on the coming release. With an award winning show and director, this live release is set to be the bands best video release to date.